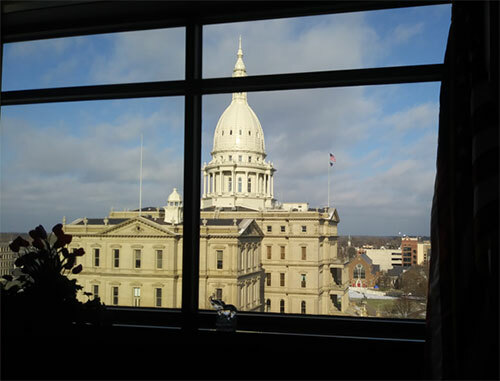 The first day of the 100th Legislature in Lansing commenced on Jan. 9, 2019. 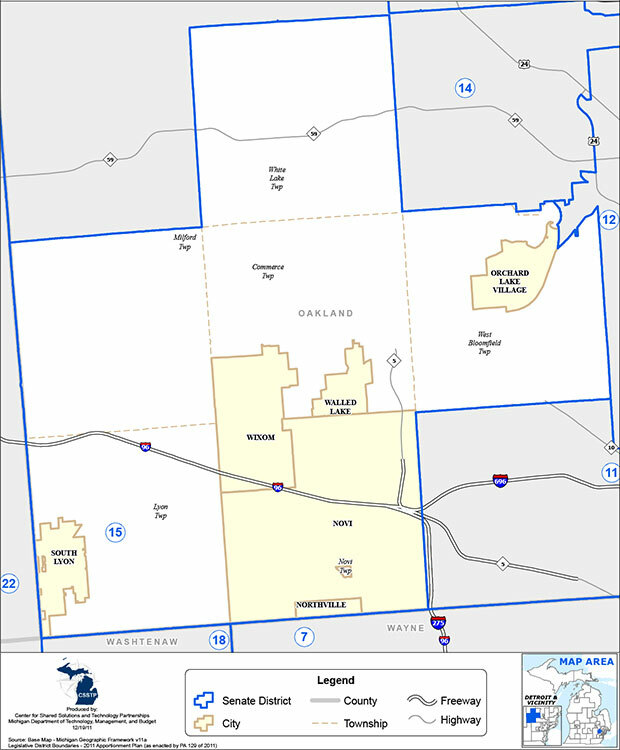 It is humbling to be elected by the residents of western Oakland County, and it is my duty to represent our district’s interests to the best of my abilities. 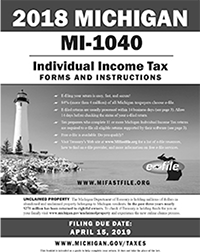 Residents can contact my office toll-free at 855-347-8015 or by email at SenJRunestad@senate.michigan.gov. Our new website is found at www.SenatorJimRunestad.com, which will include information on proposed legislation, helpful publications such as citizen’s and taxpayer’s guides, and other useful information. Included here is a summary of legislative activities from the first few weeks of Michigan’s 100th Legislature, as well as information on the budget supplemental signed into law by Gov. 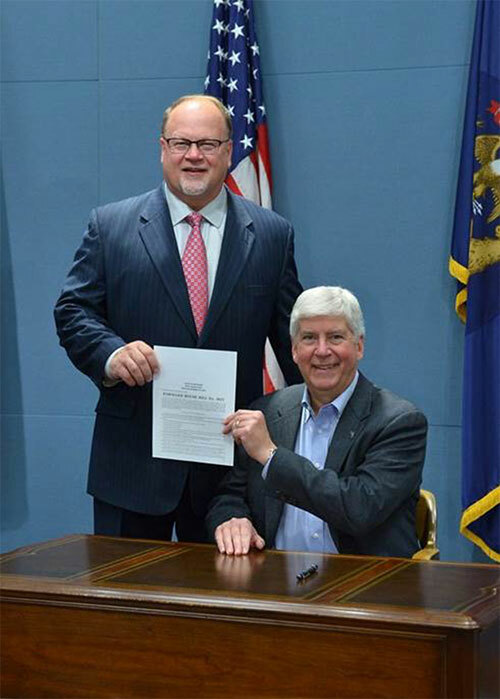 Rick Snyder and other important end-of-the-year legislative activity. Please don’t hesitate to reach out if I may be of assistance on any matter pertaining to state government. 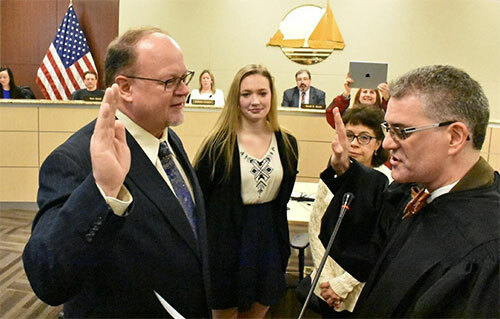 Sen. Runestad swearing-in ceremony with Judge Michael Warren at Commerce Township Hall on Jan. 8. I was joined by my wife Kathy and daughter Kayla as well as many neighbors and friends. Thank you to all of you who came out to join me! My new office location is Room 7500 of the Connie B. Binsfeld Office Building, located at 201 Townsend St. in Lansing, across the street from the Michigan Capitol at the corner of Townsend and Allegan. My staff and I are eager to welcome constituents who are visiting here in Lansing. Click here to step inside! I’m honored to be assigned two Senate committee leadership roles: chair of the Finance Committee and vice chair of the Appropriations Subcommittee on Justice and Public Safety. In addition, I am also serving on four standing committees: Appropriations; Education and Career Readiness; Families, Seniors, and Veterans; and Judiciary and Public Safety; as well as the Appropriations Subcommittee on Capital Outlay. 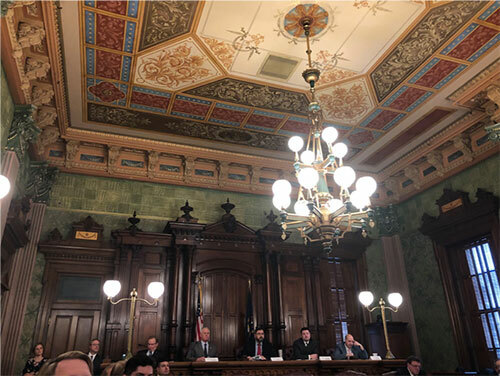 First meeting of the Appropriations Committee, held in the historic Supreme Court chamber built in 1879. This is the most ornate room in the Capitol. While most of the rooms have been painted up to 19 times over the years, the Supreme Court chamber still has its original paint on the ceiling. Take time to see this room if you visit the Capitol. 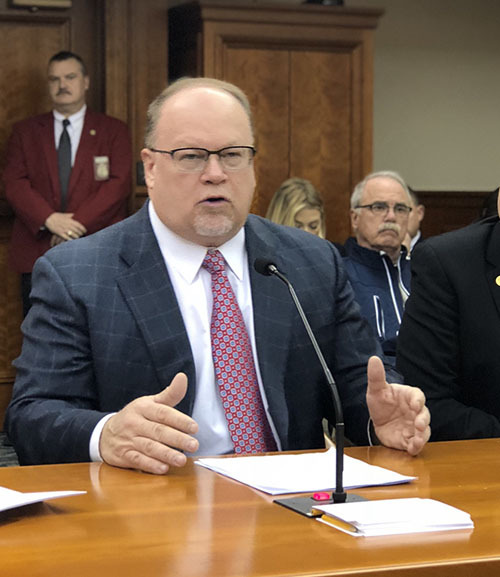 On Thursday, Jan. 24, the Senate Committee on Judiciary and Public Safety reported out Senate Bill 2 (Senator Lucido), legislation requiring a guilty plea or criminal conviction for civil asset forfeiture. 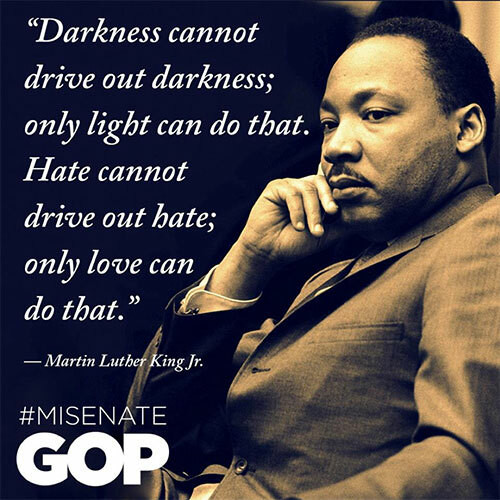 I was pleased to see this bill that I worked on with then Representative Pete Lucido passed. We worked with many stakeholders to get to this point, including receiving many great suggestions by law-enforcement. Passing this bill out of committee means it will now be sent to the Senate floor for a possible vote. The federal government is not prioritizing the investigation and prosecution of mail theft unless it also involves identity theft or a very high monetary threshold. Local prosecutors need a state tool to crack down on state mail theft. Over the last year, I’ve worked with the Prosecuting Attorney Association of Michigan, the Wayne County Prosecutors Office, Michigan State Police, local law enforcement, and the U.S. Postal Inspection Service to seek solutions. I introduced Senate Bills 23 and 24 to allow for state prosecution of mail theft. This week I introduced Senate Bill 57 to establish a “cooling-off” period for legislators who become lobbyists after leaving office. 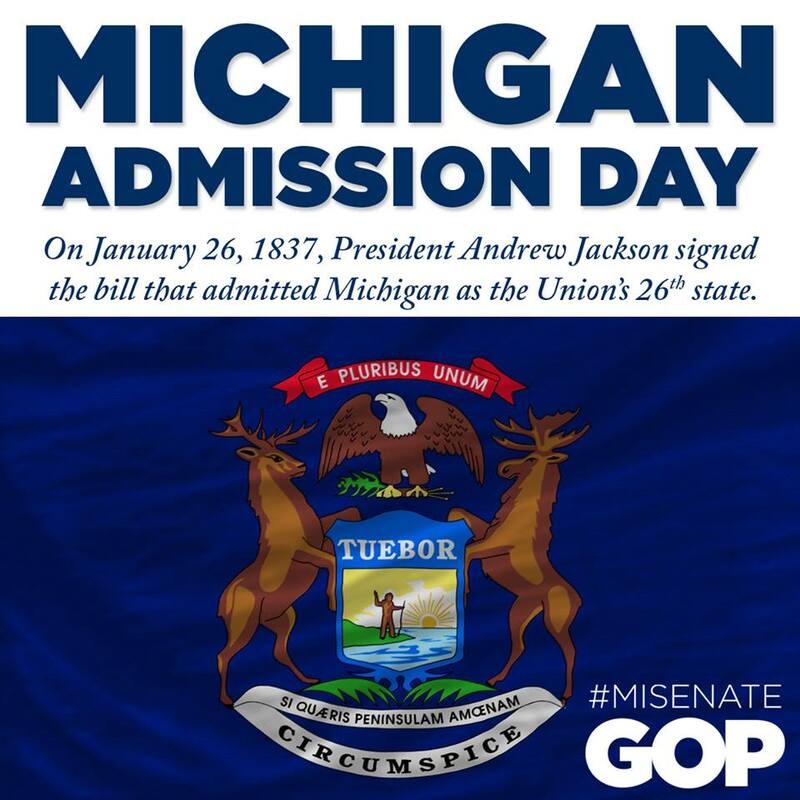 Michigan is one of only a handful of states that does not impose a waiting period. Among the states that provide for cooling-off periods for former legislators, 26 require a one-year gap between legislating and lobbying, 10 states set the waiting period to two years and two states provide for limits between zero and 12 months. Homeless shelters, food kitchens and food banks all provide critical services to help those most in need in our communities. I introduced Senate Bill 55 to provide charitable giving tax relief to residents who want to help their neighbor in need. This legislation would enable residents to claim an income tax credit of up to 50 percent of the total cash value of charitable contributions to shelters for homeless people, food kitchens, food banks or other similar organizations. Public Act 559 of 2018 (Runestad) removes an antiquated requirement that Michigan State Police take cash at the roadside as bond for out-of-state residents. 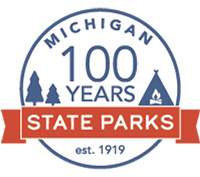 Higher-than-expected tax revenue generated by Michigan’s healthy economy allowed the Legislature to direct even more funds to vital projects late last year. • $100 million added to the “rainy day” fund to beef up the state’s savings account. Substitute teachers are in short supply in Michigan. In fact, the discipline is included on the state superintendent’s critical shortage list. Legislation now signed into law makes more substitute teachers available in difficult-to-fill areas and improves public education. Public Act 418 of 2018 allows individuals with professional credentials and career expertise to substitute teach in a career tech education program. It also allows individuals younger than 22 years of age to substitute teach in high school; many student teachers are under 22 years old and perform well. The new law takes effect on March 20, 2019. 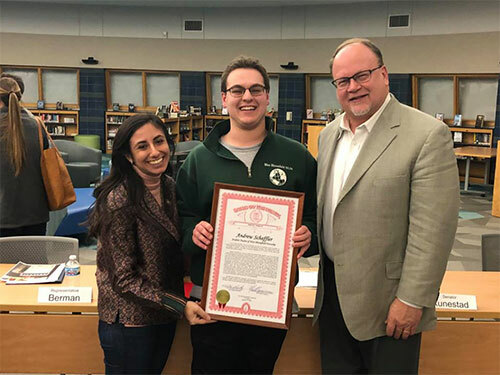 It was a privilege to present a legislative tribute to Andrew Schaeffler, student trustee for West Bloomfield Township, for all of his endeavors and service to the West Bloomfield community. A big thanks to Andrew and his family. It’s safe to say our future is in good hands! Our community offers so many incredible opportunities for our youth. 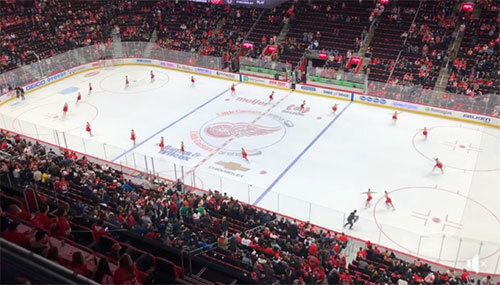 Shown here, my daughter’s synchronized skating team performs at the Red Wings halftime show. Click here to go to video! If you wish to unsubscribe, please do so below. Thank you for taking the time to read this legislative update and please don’t hesitate to contact me if I can be of assistance on any matter pertaining to state government.